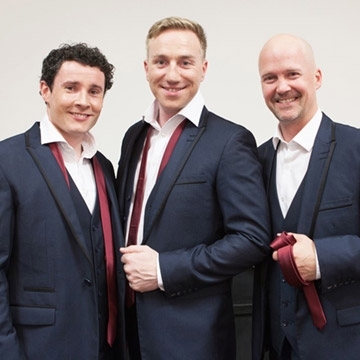 Dominic, Shane, and Derek – collectively The Three Tenors Ireland - perform up to 100 concerts annually in major venues throughout Ireland & UK. The Irish trio has regularly appeared on both BBC and RTE. RTE award-winners Dominic, Shane, and Derek promise a magical night to remember as they perform an exciting Celtic flavoured programme, with uplifting songs made famous by world superstars including Sinatra (My Way), The Dubliners (Wild Rover) and Pavarotti (O Sole Mio/Nessun Dorma). You’ll also love their new arrangements of hits such as ‘Over the Rainbow’.